El Rio’s 31! Hooray! Being able to drink in the open air is the best. Mission Mistaken asked for some recent history on El Rio, but my time machine only starts working a minimum of half a century back. 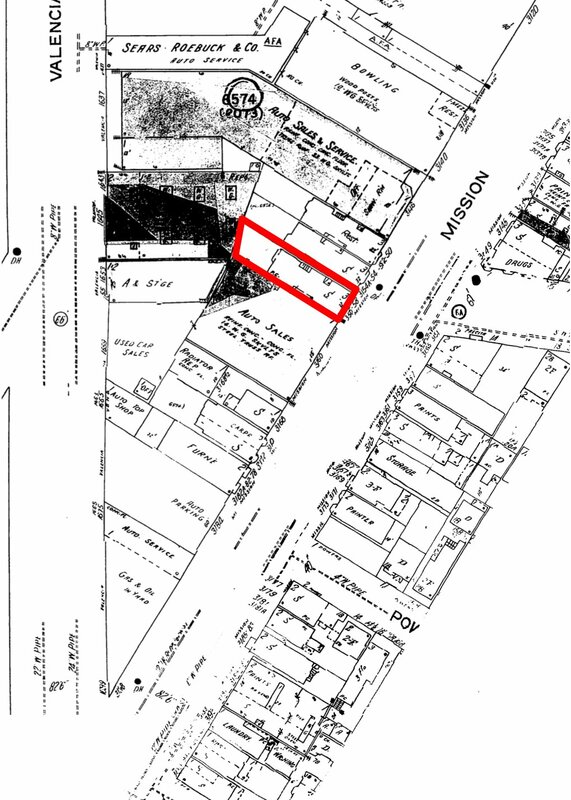 El Rio’s future site is the red rectangle. The 1859 US Coast Survey map (surveyed in 1858, published in 1859) is digitally available thanks to the fine work of David Rumsey, including a Google Earth layer. A field and a creek mark what will become El Rio. Valencia is not yet a road, and the path that will become Mission makes a hard right at stone wall bordering Precita Creek, the future Serpentine/Army/Cesar Chavez. 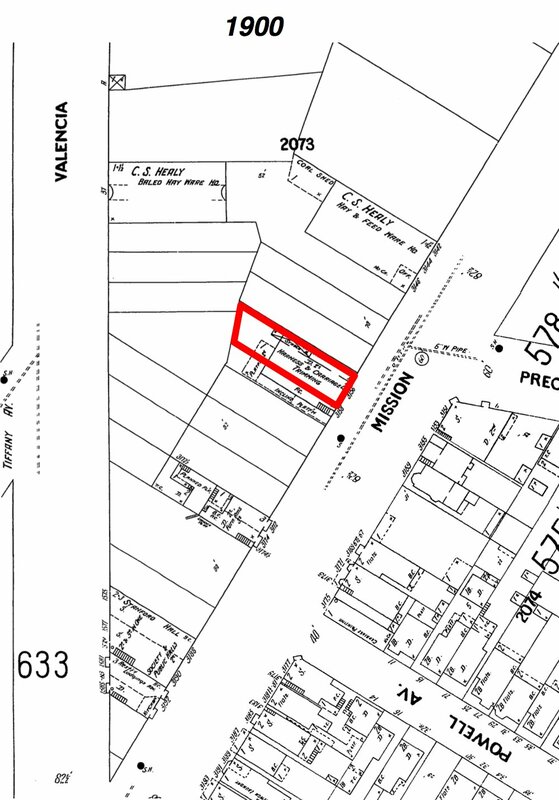 A few building are clustered to the west of the future El Rio site, around the “Road to San Jose” (now cut off by the St. Luke’s doctors parking lot, Salvation Army and Guerrero Park). After a successful stint as a government administrator in San Jose, Bernal was given a land grant in the 1830s that encompassed most of the land south of CC and east of the road to San Jose. The Rincon de las Salinas land grant (encompassing La Lengua, Bernal and Excelsior/Crocker/Outer Mission) was secured by 1839. (He previously received a grant of farmland near Mission Dolores in 1834 and was given a third grant, El Potrero Viejo (Bayview and Hunter’s Point) in 1840. The history of the passing of the Bernal grant was similar to that of nearly every one of the great Spanish and Mexican families who once held a huge portion of the best agricultural and grazing lands of Alta California. The dons and their descendants lived a feudal life, giving little care to business and leaving their vast herds of cattle and horses and great flocks of sheep largely to the supervision of the vaqueros and herdsmen. The homes of the owners were centers of hospitality. The Bernal family was no exception to the deep seated tradition of extending hospitality. The best road from the little Mission Dolores and the Presidio to the southern missions ran at the foot of the hill where the Bernal hacienda stood. The latch string was always out, and day or night weary travelers were welcomed by the Bernal overlord. It was this carefree life and lavish hospitality, coupled with the lack of good business instincts that led to the gradual breaking up of the grants. When the owners needed money, especially when the country began to attract Americans following the Mexican war, they borrowed. They never seemed to get ahead, and little by little the vast ranchos were whittled down through foreclosure of the mortgages. 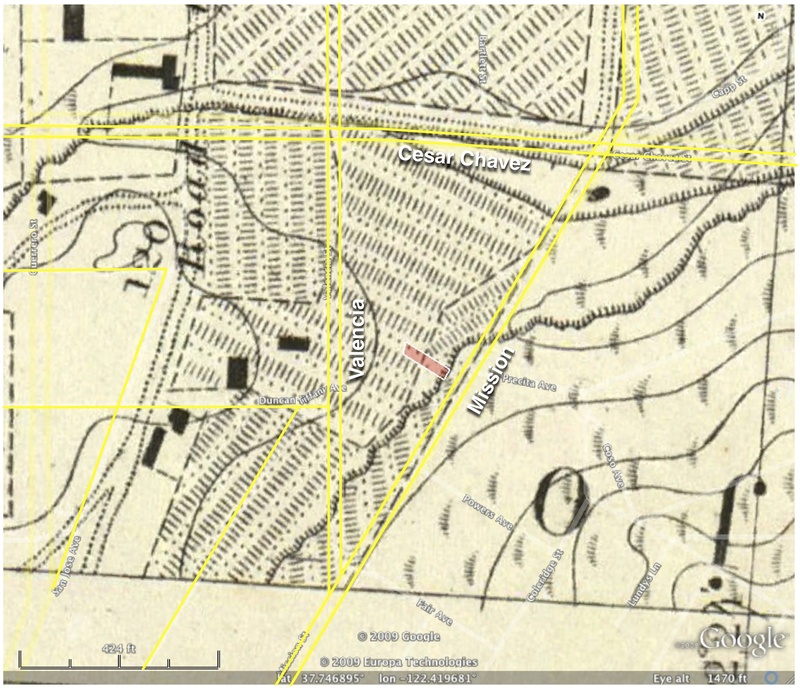 SOLD FOR $1500: The first portion of the Bernal grant to pass to other hands was in 1859, when a foreclosure of a mortgage held by General William T. Sherman, resulted in the sale of a large tract from Butchertown to the San Bruno road by the Sheriff for $1500. General Sherman had loaned old Bernal $4298 in the early fifties. (ed: $4298 in 2009 dollars is about $100,000.) Later, the tract containing Hunters Point and South San Francisco was also sold for $1500. Other portions were sold from time to time, until in 1908 the last owner under the grant, the late Jose Cornelio Bernal, found himself in possession of only about twenty-five acres located west of Mission road in the little valley crossed by the Ocean House road, now Onondaga avenue, and used for vegetable gardens. This last tract was lost through foreclosure in 1917, and it marked the passing of the final bit of San Francisco real estate from the families of the original grantees. Thanks to Greg Pabst and his expansive article on the Bernal family, even longer than my typical diatribe but well worth the read. 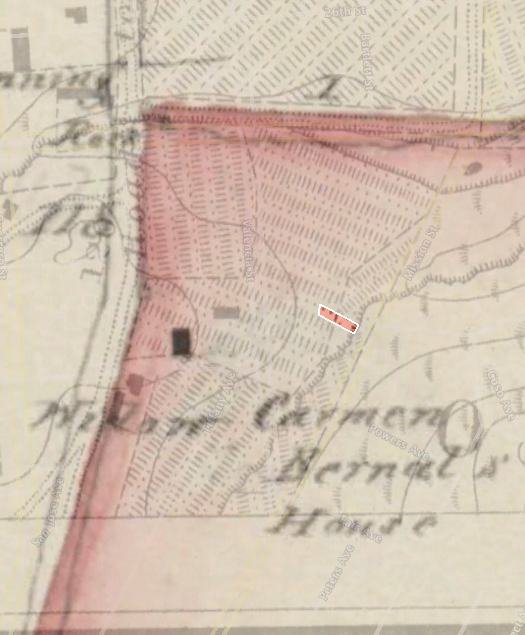 UPDATE: Spanish land grants had to be approved by the US Federal government after California entered the Union, and here is a slice of the 1857 map showing the approved boundaries of the Bernal tract. Bigger map of the tract on Calisphere. The Bernal residence was on the north side of what is now Duncan, at the SE corner of the St. Luke’s parking structure. 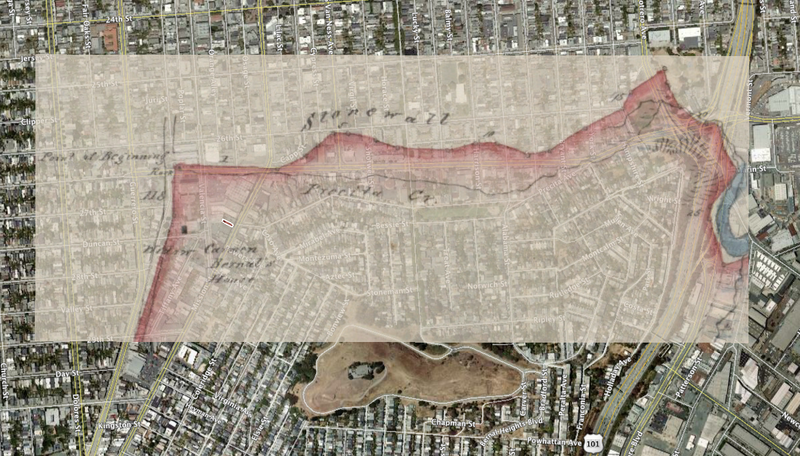 Mashup of Google Earth, the 1859 Coast Survey map and the Bernal Survey. I wish I had a seal like this for my house. El Rio is an empty lot, next to some dude’s house, a glove factory and Misters Somers & Healy’s Hay, Grain, Wood and Coal Emporium. 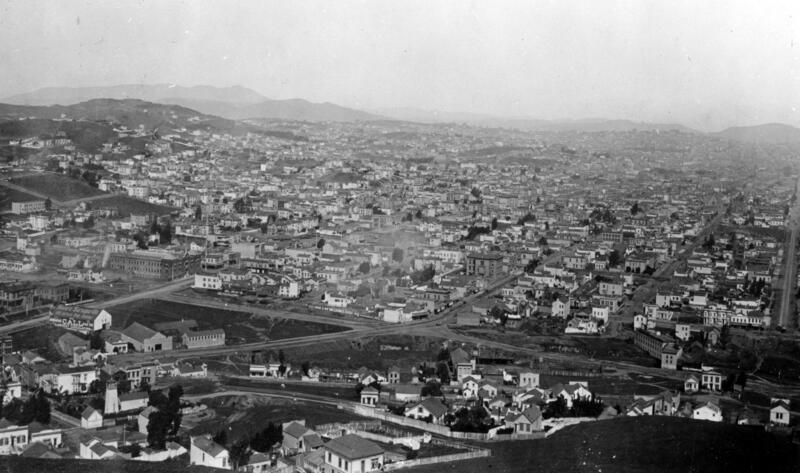 In fact you can see many of the buildings in this wonderful (but sadly small) picture of the Mission from the SF Public Library’s collection, taken from the top of Bernal in 1888. You are looking to the NW and you just should be able to see the Mission/Valencia/Army triangle in the center, heart of La Lengua! 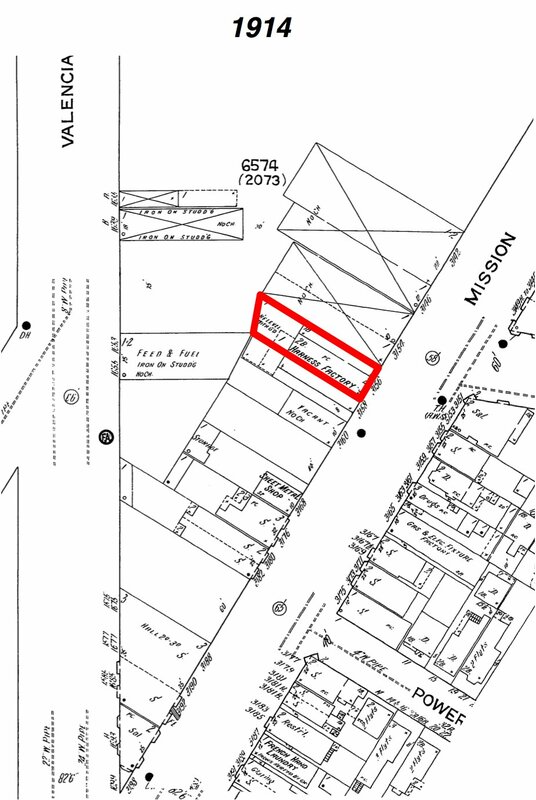 The 1908 directory tells us that JW McTigue owns that harness shop over at 3154 Mission on the future Rio site. And there seems to be a saloon across the street as well now – hooray, that’s handy! I bet Thomas Donlan’s bar at 3151 Mission is a fine establishment where you could get a nice steam beer from his wife Julia, listed in the 1915 SF phone book. 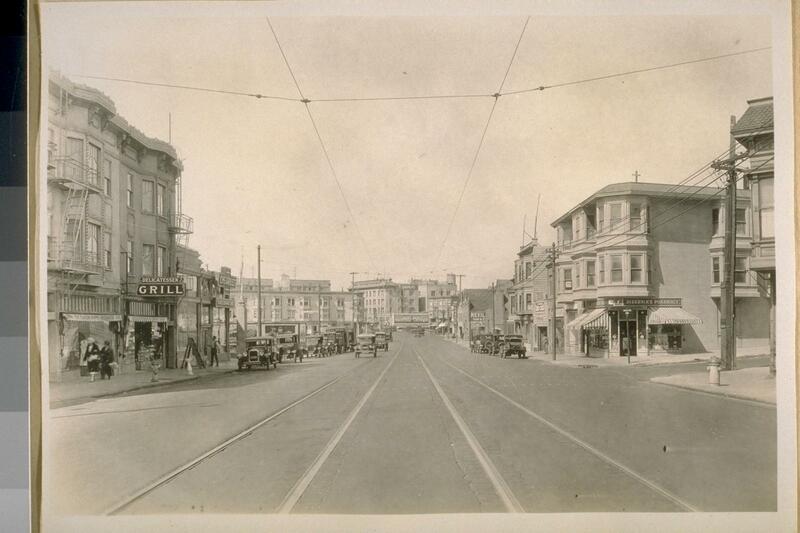 More saloons — one on the tip of Valencia and Mission — a drug store. Joe McTigue is still hard at work, and other friends and neighbors on Mission are listed thanks to the hard work of the Bernal History Project. Joe (and his wife Mary) are still listed in the 1921 directory. UPDATE: UC Berkeley Calisphere has a picture of the McTigue building in 1923, with carriages out front. But within three years, the building will be torn down. 2012 UPDATE: A commenter in a Bernalwood post did a rundown on the McTigues! Did some genealogical research on the McTigue family, the harness makers. Michael McTigue and Frances Acton were Irish immigrants born in 1830 and 1832 who started the business South of Market . In 1872, they were living at 273 Minna, In 1880 on 8 1/2 Moss. with children Augusta, Fanny, Joseph, Richard, John and Jennie. 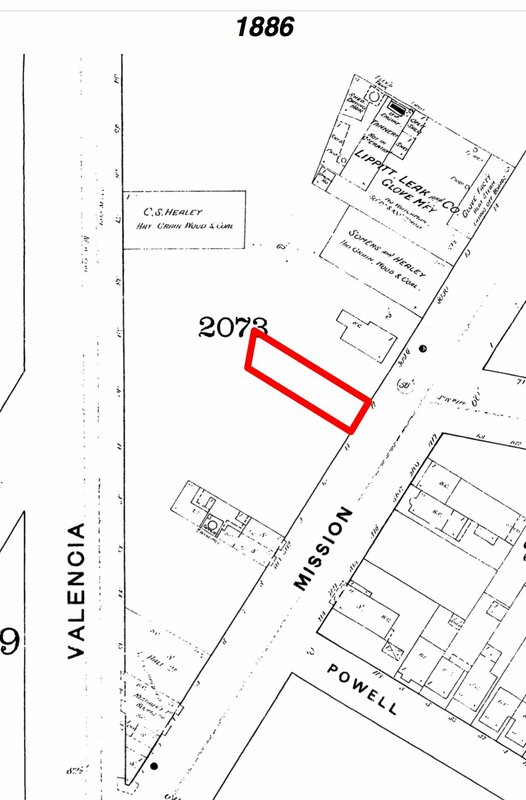 By 1896 they were living at 19 Alvarado with their harness factory at 3156 Mission Street. Joseph W. McTigue was born in 1866 and died in 1939. He married Mary Theresa Costello and they had a daughter, Marie. She married William Dabel and in the 1940 census they lived at 3182A Mission Street. They had a son William (1927-2006) and I”m trying to trace his descendants. A corner that once specialized in horse-related industries made a wholesale jump into cars (and on the east side of Mission, apparently paint). Click to zoom. Pretty much everything in the triangle south of Sears is car related, with the exception of a bowling alley (where Roccapolco is now) and a beauty parlor. Atlas Motors’ historical echo is doing the same thing as now, the AAMCO is the old Sears auto department, and Kragen was a car dealership – Mission Chevrolet! UPDATE: The crack Imaging Systems team at Telstar Logistics points us to these shots of Mission and Precita in 1926 and 1927 from the UC Berkeley archives. You can see Mission Chevrolet under construction in the first shot, and finished in the second. 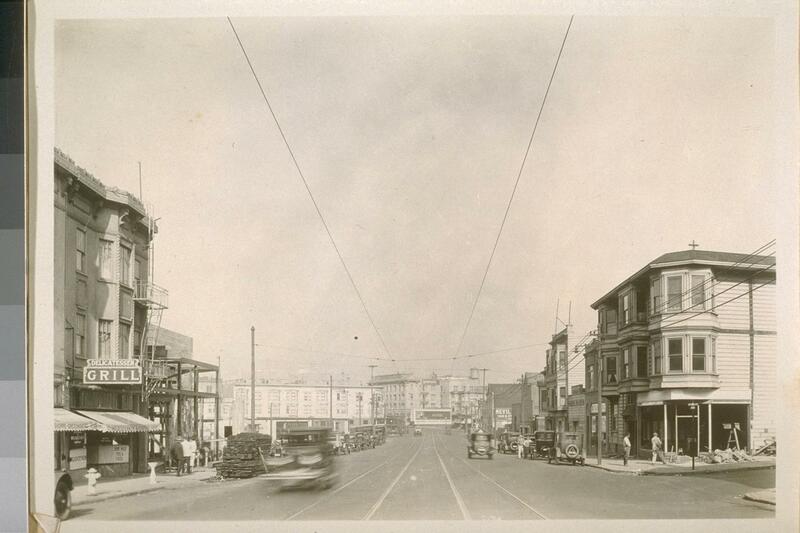 The restaurant on the left will be called the Superior Grill in the 1930s, and will come to house Nap’s. And here’s that great picture of the gas station on the corner of Valencia and Mission in 1944. Some will remember the then-and-now shot I made a while back. Finally, the Telstar Logistics Aviation Group presents us with this picture of the intersection in October 2009. And such is 151 years of history from the corner of Valencia and Mission. Happy birthday, El Rio. This post kicks arse. Thanks for the research! Same corner, Aug 1927. Mission Chevrolet is clearly visible. Ooops. Forgot this… here’s the same block, as seen from above, when I flew over in a Cessna on Saturday. It so clearly matches the property maps shown in your post! Thanks for the pix, TL. That aerial shot is awesome — too bad I was out of town otherwise you would probably have caught me working in my yard. This shot lookin southon La Lengua and Bernal is particularly awesome. It’s like Google Earth in real life! Jesus Christ! Where do you get this stuff? Are you doing some kind of penance where they have you chained up in the basement of the library and your only contact with the world is the internet? wow- thanks so much for doing this. any history prior to a bar being here before elrio was unknown. fabulous! thank you! My pleasure. Do you have any details on what bars and restaurants were in the current space before you moved in? Updated to include the 1859 Coast Survey map, the possible location of the Bernal ranch, and a picture of the McTigue building. This is awesome! I really want to get a complete history on the building. According to our earliest archives the bar was previously called the Count Down and featured velvet paintings of naked women, red flocked wall paper, and, of course, the beloved shuffle board table…that, for all we know could have been there since the land grant days. the post is seriously great! Thanks! That Bernal history link still works on my end, hoping it was just a DNS or server snafu. Try http://j.mp/hPQbWS – or I can send you my backup copy. ohhh, THAT obit. Let me dig around. Looks like the Bernal History Project folks did some server side changes — old .html pages are now .php – so that obit is available at http://www.bernalhistoryproject.org/bernalobit.php (link updated in article).